The cloud mining service provider Genesis Mining now offers more Ethereum cloud mining hashrate after briefly being out of stock due to the high user demand. Unfortunately the return of more available Ethereum cloud mining hashrate for sale comes with a significantly higher price per MHS than it was available for before. 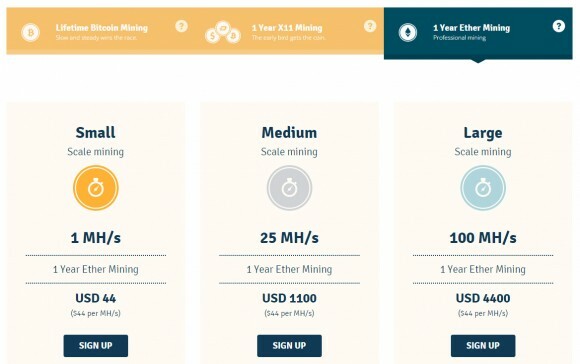 Previously 1 year mining contracts were available at $17.99 USD per MHS with all included fees for the term of the contract and now the price is set at $44 USD per MHS for the same terms or more than double the old price. One can argue that in the recent days there has been a significant jump in the exchange rate of Ethereum’s Ether (ETH) coins on the market, more than double, and the performance per GPU is lower because of the increasing DAG size, but it is not clear if this will be a long term price increase or it is just temporary jump. So while at the old price the Ethereum cloud mining contracts were very attractive, but they are not anymore now that their price has been significantly increased… will have to wait and see. Meanwhile should you decide to purchase some Ethereum cloud mining hashrate you can get an extra 5% discount from the regular price by using our special promotional coupon code CryptoMiningBlog5 during the checkout. The Bitcoin network difficulty is skyrocketing lately and as the trend continues buying ASIC miners or cloud mining hashrate at the old prices that were available for the last few months was not a very good idea as the mining profit dropped significantly even though the BTC exchange rate has risen as well. Today Genesis Mining has announced a significant decrease in the price of Bitcoin cloud mining hashrate as well as a reduction in the maintenance fee thanks to the deployment of new mining hardware. 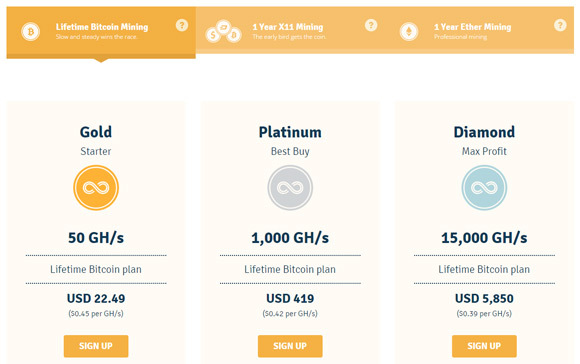 The new prices are as follows: $26 USD for 100 GHS ($0.26 per GHS) Lifetime Bitcoin mining plan, $499 USD for 2000 GHS hashrate ($0.25 per GHS) and $2400 USD for 10 THS ($0.24 per GHS). These new prices are for new purchases of hashrate at the service and they also come with new lower maintenance fee of $0.00055 USD per GHS down from the old fee of $0.00069 USD per GHS per day. This should make new purchases of Bitcoin cloud mining hashrate more profitable for the time being, though it seems that the total Bitcoin network difficulty is continuing to grow quite rapidly so you should think well before doing an investment in mining hashrate and that goes not only for cloud mining for BTC. The cloud mining service still offers X11 cloud mining hashrate as well via GPUs, but it has been temporary out of stock of Ethereum (ETH) cloud mining hashrate due to the high demand that is associated with the recent serious jump in the price of the Ether coins. We are being promised that there will be new GPUs installed soon and more Ethereum cloud mining hashrate should become available for miners that are interested in purchasing such. If you decide to purchase some cloud mining hashrate do not forget that you can get an extra 5% discount from the regular price by using our coupon code CryptoMiningBlog5 during the checkout, so do take advantage from that special offer. If we have to point our favorite cloud mining company in terms of reliability and trust, then it is definitely going to be Genesis Mining. Apart from providing good and stable services, this is the only cloud mining company that provides users with the ability to purchase Bitcoin (SHA256) cloud mining hashrate provided by ASICs as well as DASH (X11) and Ethereum (ETH) hashrate powered by GPUs. Unfortunately the earlier adopters might not be way too happy if they have purchased hashrate with higher maintenance fee as with the recent rapid increase in the total Bitcoin network hashrate and the high exchange rate per BTC the profit might not be that great. Currently the service sells Bitcoin cloud mining hashrate with $0.00069 USD per GHS per day as a maintenance fee, but some months ago it was $0.0012 USD per GHS and prior to that $0.0015 USD and even before that $0.002 USD. It is important to note that the maintenance fee is set at the time you purchase hashrate based on the currently set feed (depending on the generation of mining hardware being used). This means that if you have purchased 1 THS Bitcoin cloud mining hashrate 1 year ago, then now it would be earning you less than if you purchase 1 THS hashrate at the moment. Of course you would have mined for 1 year with that 1 THS, but then again you would have been mining for 1 year already with that previously purchased hashrate at a much lower difficulty. Unlike with Bitcoin cloud mining contracts that are Unlimited (mining for you until they are profitable) With X11 and Ethereum cloud mining hashrate you are getting 1 year term contracts with no extra maintenance fee, everything is included in the price you pay for the hashrate. 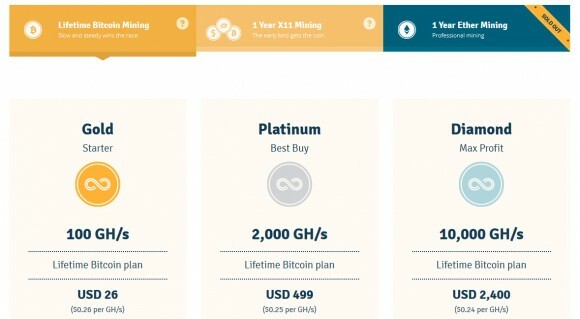 The question that arises here is what kind of cloud mining hashrate is more profitable to invest into now from the three different ones available if you consider they will be operational for 1 year if you have a set amount of USD to invest. Let us say we have $1050-1060 USD available to invest and they will get us 2.5 THS worth of Bitcoin hashrate, around 59 MHS Ethereum hashrate or 50 MHS X11 hashrate. So at what profits are we looking at after 1 year in terms of BTC (using current DASH and ETH exchange rates to BTC)? We know that Bitcoin will have its second reward halving around the middle of the year and with the recent months we have seen a very steep increase in the network difficulty. So if we estimate that the total hashrate will at least double in the next year and the reward will drop in half in six months we can roughly estimate to expect to mine about 2.2 BTC (without taking the fees out of the equation) which is less than what we’d have to invest at the current BTC to USD exchange rate… however with Bitcoin reward halving and a significant increase in the difficulty we should also see an increase in the price of BTC. Moving to Ethereum, a hashrate of 59 MHS with an expectation that total network difficulty will be double in a year should result in about 3.75 BTC equivalent if the ETH/BTC exchange rate remains the same as it is now. This at the current exchange rate of BTC to USD is more than we would have to pay for the hashrate, but then again we expect that in a year time Ethereum will be worth more than it is now just like BTC should be and the USD value should be higher. There are some concerns that Ethereum might switch from PoW to PoS in less than 1 year, in such case the hashrate you purchase will be switched to X11 hashrate. What about the X11 cloud mining hashrate, what we should expect from the DASH mining with 50 MHS hashrate? This seems to provide the worst scenario at the moment with an estimate of just about 155 DASH coins mined in a year or about 1.78 BTC if the current exchange rate remains the same. With DASH (previously know as DarkCoin) things are more steady so it might be easier to do a more accurate longer term prediction. In the end however it might be more profitable to just buy Bitcoin at the current price and sell it in a year than to purchase Bitcoin cloud mining hashrate or X11 cloud mining hashrate, with Ethereum cloud mining however you are most likely going to realize some good profit, but don’t forget that we have done just some rough estimates and in 1 year time things might look completely different. So be careful and think twice before making a decision should you invest in cloud mining hashrate, what type of hashrate to invest into or should you just buy some Bitcoins and wait for them to become even more expensive than they already are.